Whenever our Section Chief calls for a bonding activity for his team, it is usually over food and beer. Just before the start of the summer break (1 week vacation! ), we had a so-called BBQ party at Shimizu (Park)Koen's day camp grounds , located in Chiba Prefecture (just a few train stations away from work/home actually). 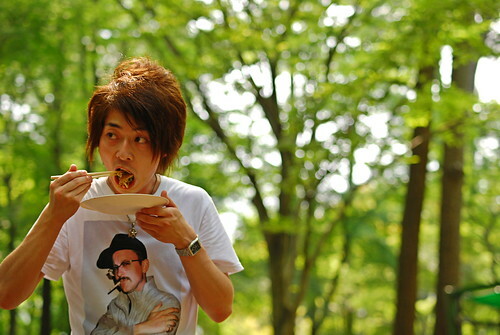 Here is a shot of one of our team mates, Kanno-san, sporting the usual David Bowie look. Since most of them were camera-shy, I had to take candids, and this is what I got.